The people of Mexico have overwhelmingly elected progressive candidate Andres Manuel Lopez Obrador to be the next president of Mexico. Please click below to send the following message to the people of Mexico, a message that will be delivered to Mexican media and organizations in both English and Spanish. Unlike President Trump, we wish you well. Not ill. And we send good wishes to your incoming, progressive president, Mr. Lopez Obrador, whom you've elected in an historic landslide to carry out your will to reduce inequality, corruption and violence. Unlike President Trump, we do not scapegoat you for problems in our country. Unlike President Trump, we are proud to be a multiracial country and proud of the contributions made to our country by generations of Mexican immigrants. We are appalled by the separation of children from their parents at the border. And we do not support erecting a wall between our two countries. 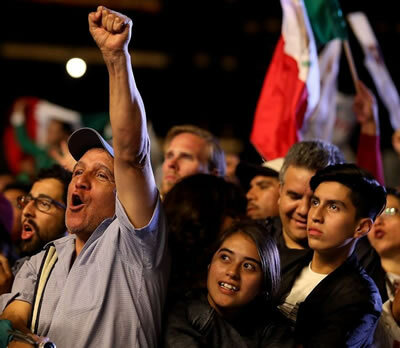 Unlike President Trump, who received only 46 percent of votes cast and three million votes less than a competing candidate, we recognize that your incoming president earned the support of a strong majority of Mexican voters. We vow to do our part to allow you, the people of Mexico, to determine your own political future. We know the dreadful history of our government’s bullying interventions in the internal affairs of Latin American countries – and that our government has used phrases like ‘human rights,’ ‘pro-democracy’ and ‘war on drugs’ to prettify interventions that have brought corporate exploitation, militarism, chaos, and even dictatorship to other countries. We send good wishes to the people of Mexico and to President-Elect Lopez Obrador. 14851 8 months ago Win Tracy New Yirk, NY People of Mexico, I pray everyday that your families who have been separated from each other by our president non grata's amoral immigration policy will be reunited. 14835 8 months ago Sherrill Futrell Davis, CA Lo que dice Trump no importa a nadie, nunca. Es idiota y sinverguenza y un dia va a morir. Gracias por elegir un buen presidente, Lopez Obrador!